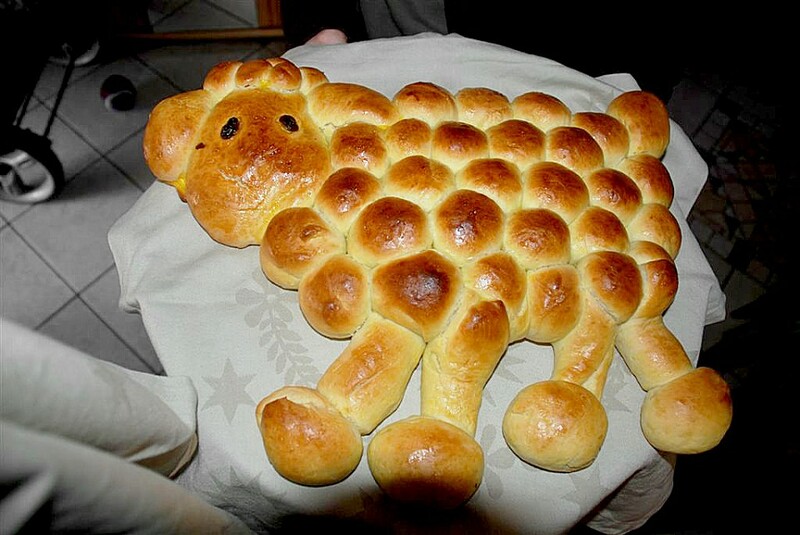 The Easter sweet lamb bread will be the highlight on your Easter breakfast table. Enjoy it with your favorite jam, Nutella or just butter. Happy Baking! preparing time about 40 Min. - Make a dough out of all ingredients; cover dough with a clean kitchen cloth and let rise until its volume has doubled (that can be from 30 min-1 hour); knead again. - Make small dough parts for the lamb as you see in the photo. Spread some oil on the baking board, this inhibits that the dough gets sticky and you won't use additional flour. 4 smaller balls for the feet (optional). 1 part for the tail; 25 small balls for the body (fur); some mini balls for the fur between the ears. Keep some space between all parts. - When the lamb is done let it rise again for at least 10 minutes. - Pre-heat oven on 180 C or 360 F.
- Beat egg yolk and spread all over the dough parts. Place raisins for the eyes and spread egg yolk over it. - Sprinkle almond leaves all over the lamb, then bake it for 20-25 min; maybe place some foil on top for the last minutes so it won't get too dark.